A business built on strong customer and vendor relationships. At Triumph Construction Supply we understand the value of maintaining great customer relationships. The customers that helped start our business in 2010 are still our strongest customers. Through our growth, we have recognized that the same amount of dedication to each new customer is necessary to ensure Triumph’s future success. When establishing vendor relationships in 2010 we recognized that we had the benefit of choice. We chose vendors who could offer competitive prices in our market. Our owners had long standing relationships with many of these vendors, others were chosen because their prices were unbeatable. Though we remain a small, family-owned business, we continue to compete directly (and successfully) with large national companies. We also recognized that the material we provide is only a small portion of a much larger project. As our company slogan suggests, ‘Dedicated to Contractor Success,’ we take the necessary steps to ensure that material is delivered on time and in the most quality, cost-effective way possible. We provide honest lead times and will never over-promise on delivery dates. At Triumph Construction Supply we take pride in our contributions to construction projects in Kansas City and throughout the central United States. Our favorite part of the job is the customer service we provide, which we see as our chance to bring value and expertise to help our customers succeed. 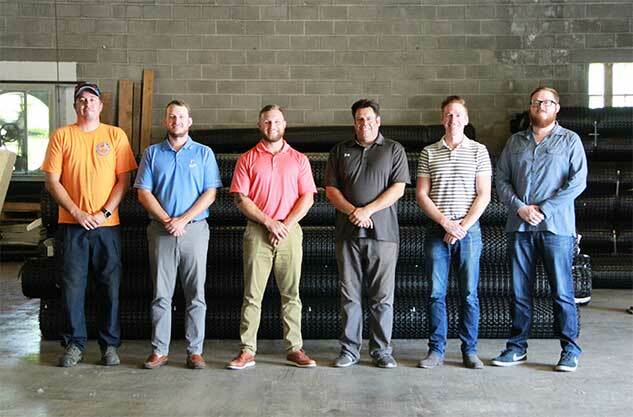 As members of the ACPA, Missouri Concrete Association, AGC, and Builders Association and proud supporters of our Kansas City community, we plan to continue to engage with our customers in the field by supporting local students enrolled in construction management programs and developing relationships with tomorrow’s industry leaders. As an industry veteran, Dan has built his 45-year career on selling construction materials. His inherent ability to connect customers with products and ideas that are favorable to the customers’ bottom line make him perfectly suited to his roll. Having worked in the construction material industry for the past 18 years, Matt brings his expertise in products, market prices, lead times and logistics to the team. Max has worked for Triumph for eight years, handling a wide array of the company’s bookkeeping and accounting functions. Max is pursuing a Master of Accounting degree from the University of Kansas for his continued development in the accounting profession. Tyler has worked from Triumph for seven years and focuses on tracking projects from the pre-bid to construction phase. He focuses on lead and proposal generation, material certification, and market research. The voice of Triumph Construction Supply, Greg is the primary contact for customers who call to place an order. Greg has been working at Triumph to three years. He’s responsible for inside sales and is in regular contact with both customers and manufacturers. Ryan has been the face of Triumph for nearly four years, delivering material to job sites throughout the Kansas City area. He has impressed customers with his punctuality and the care he takes in loading and unloading material. The newest member of our team, Kyle has been working at Triumph for under one year. Kyle has been tasked with building relationships with new customers as well as maintaining relationships with customers on area jobsites.